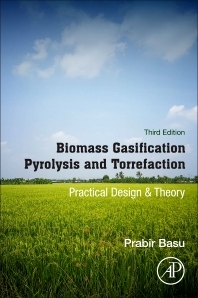 Biomass Gasification, Pyrolysis and Torrefaction, Third Edition, is enhanced with a new topic on processing and cleaning of product gas of gasification and a brief introduction to biomaterials, making it a versatile resource that not only explains the basic principles of energy conversion systems, but also provides valuable insight into the design of a complete biomass conversion systems. With a dedicated focus on the design, analysis and operational aspects of biomass gasification, pyrolysis and torrefaction, this edition offers comprehensive coverage of biomass in its gas, liquid or solid states in a single accessible source. The author provides many worked design problems, step-by-step design procedures and real data on commercially operating systems. Although the book carries the name ‘biomass’, the bulk of its content is also applicable to non-biomass fuels like coal, petcoke, municipal solid waste and others. This book will help engineers, scientists and operating personnel of biomass gasification, pyrolysis or torrefaction plants, gain better comprehension of the basics of biomass conversion. Biomass Gasification, Pyrolysis and Torrefaction, Third Edition, is enhanced with a new topic on processing and cleaning of product gas of gasification and brief introduction to biomaterials making it a versatile resource that not only explains the basic principles of energy conversion systems, but also provides valuable insight into the design of a complete biomass conversion systems. With a dedicated focus on the design, analysis, and operational aspects of biomass gasification, pyrolysis, and torrefaction, this edition of the book offers comprehensive coverage of biomass in its gas, liquid, or solid states in a single easy-to-access source. The author provides many worked out design problems, step-by-step design procedures and real data on commercially operating systems. Although the book carries the name ‘biomass’, the bulk of its content is also applicable to non-biomass fuels like, coal, petcoke, municipal solid waste and others. This book will allow professionals, such as engineers, scientists, and operating personnel of biomass gasification, pyrolysis or torrefaction plants, to gain a better comprehension of the basics of biomass conversion. Dr. Prabir Basu, founding President of Greenfield Research Incorporated, a private research and development company in Canada that specializes in gasification and torrefaction, is an active researcher and designer of biomass energy conversion systems. Dr. Basu holds a position of Professor in Mechanical Engineering Department and is Head of Circulating Fluidized Bed Laboratory at Dalhousie University, Halifax His current research interests include frontier areas, chemical looping gasification, torrefaction, biomass cofiring amongst others. Professor Basu also founded of the prestigious triennial International Conference series on Circulating Fluidized Beds, and a private R&D company, Fluidized Bed Systems Limited that specializes on design, training and investigative services on fluidized bed boilers. Professor Basu has been working in the field of energy conversion and the environment for more than 30 years. Prior to joining the engineering faculty at Dalhousie University (formerly known as the Technical University of Nova Scotia), he worked with both a government research laboratory and a boiler manufacturing company. Dr. Basu’s passion for the transformation of research results into industrial practice is well known, as is his ongoing commitment to spreading advanced knowledge around the world. He has authored more than 200 research papers and seven monographs in emerging areas of energy and environment, some of which have been translated into Chinese and Korean. He is well known internationally for providing expert advices on circulating fluidized bed boilers and conducting training courses to industries and universities across the globe.